We attended a cookie exchange recently at my friend Allie's house, and her cookie contribution to the swap was SO scrumptiously delicious that I knew immediately that a) I wanted the recipe, and b) I wanted YOU to have the recipe! Allie, the blogger behind Key Ingredients, was up for a little guest post here, so I'll turn the mic over to her and let her tell you about these awesome cookies that are actually made using packets of hot chocolate mix! I'm so excited April asked me to guest post for her today. In somewhat of a wild and crazy way, April and I were friends before we actually became blogging buddies. We met while we were both on our honeymoons in the Dominican Republic and after we got to talking we learned that she and her husband not only lived in Charlotte but our houses were only a few miles from each other. My husband and I immediately sparked a friendship with them and the four of us proceeded to hangout for the reminder of our honeymoons. I love reading April's blog for her helpful advice and tidbits and I'm hoping next summer when we're both celebrating our five-year wedding anniversary we can sit back with a cocktail from her Saturday Sip & Shop and look back on that fun and unforgettable week. Until then we will continue to eat cookies together. 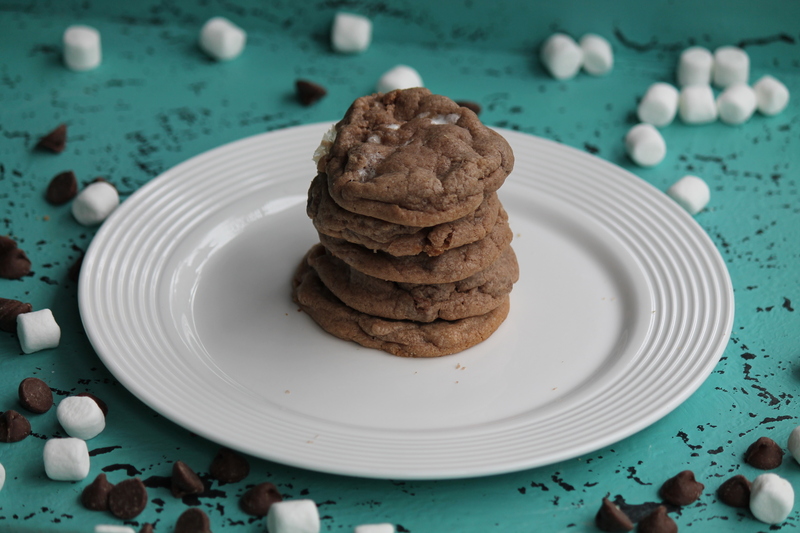 Last week my daughter and I had some friends over for a cookie party where I was able to introduce everyone to these Hot Cocoa cookies. There's nothing like curling up on the couch on a cold day with a mug of hot chocolate so you can imagine my excitement when I came across this cozy treat in cookie form. You know anything that combines hot cocoa mix, chocolate chips and marshmallows is bound to be good. This recipe comes from Love From The Oven and it's the second year in a row that I've made them for a cookie exchange party. I figured since they were such a hit last year why not bring the goodness back for a repeat appearance. 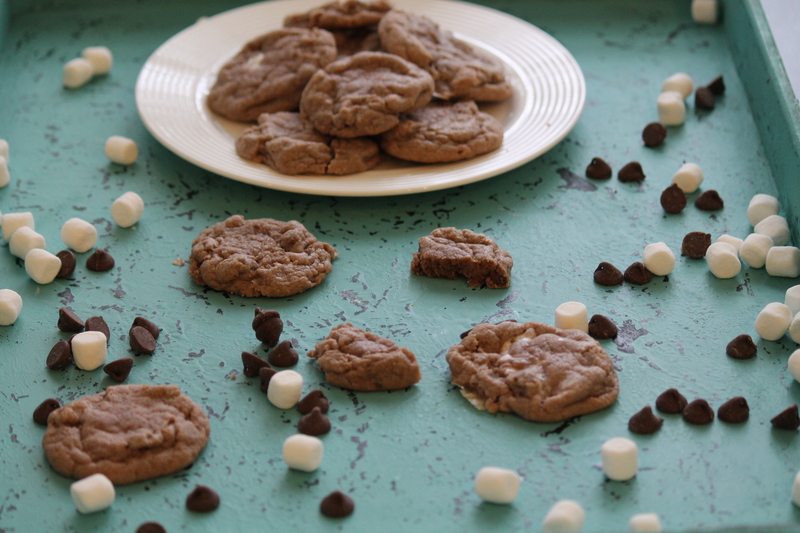 These chocolaty cookies are rich and decadent with a soft and gooey center. 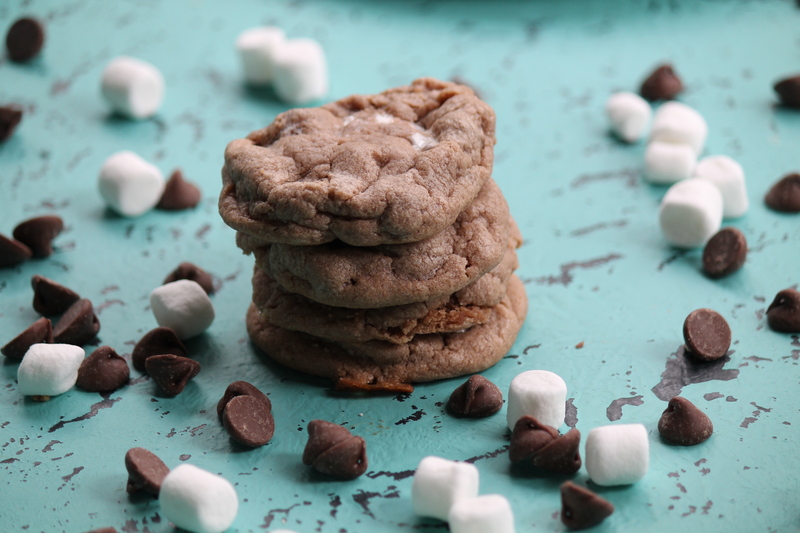 Gooey marshmallows and melted chocolate chips are studded throughout to create that warmth we all know and love in a cup of hot cocoa. If your looking for another addition to your holiday cookie platter or in need of a warm treat after playing in the snow then look no further. These cookies can also be frozen, just take them out as needed and allow to thaw on the counter or pop them in the microwave for a few seconds. I made more than enough for our cookie party so I stuck a bag of leftovers in the freezer. This method has been taste tested and approved by me my husband. Cream together butter and both sugars until light and fluffy. And in eggs and vanilla and blend well. In a separate bowl, mix together the dry ingredients, including the hot chocolate packets. Add the dry ingredients a little at a time to the wet ingredients. 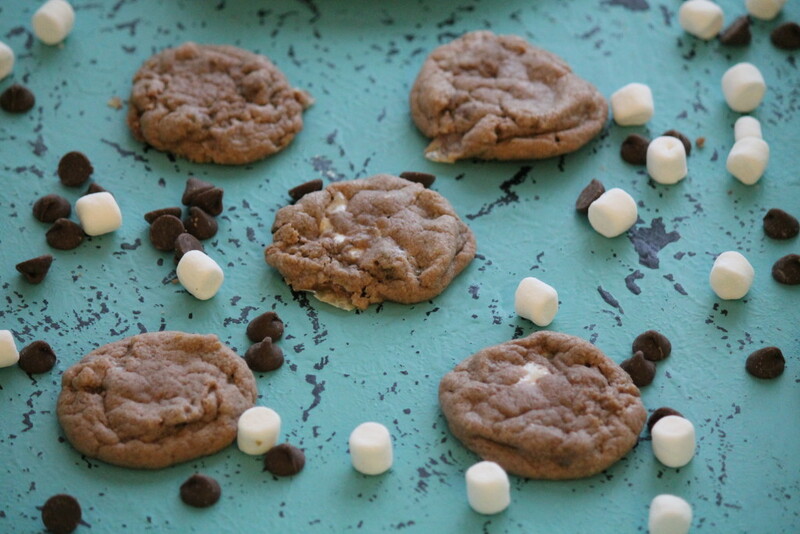 The dough will be a little dry so you may need to use your hands to work in the chocolate chips and marshmallows. Using a cookie scoop or a spoon,drop the dough onto your cookie sheets. You may need to "form" them a bit with your hands. Bake in an oven preheated to 350 degrees for 8-11 minutes. (I did 9 and they turned out perfect). YUM!! Perfect contribution to bring to Christmas dinner! I like cookies very much, this is my favorite dessert. And of course I'm glad that there are so many different receipts to diversify my tea drinking time. Sometimes I buy ready cookies of a high quality with good discounts by Essayontime.com . But I cook them myself more often.